We would like to invite you to join us on the last Saturday of each month at 8:30am for a relaxed start to the weekend. 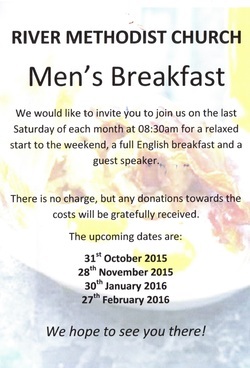 Full English breakfast and a guest speaker. The dates are listed above. There is no meeting at the end of December I'm afraid. After all the Christmas food you might be glad of the break.